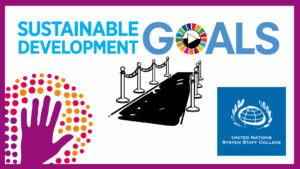 Sustainable Development Explainer Video Contest: Win a free spot in the UNSSC Foundational Course on the 2030 Agenda! In collaboration with the UNSSC, through its Knowledge Centre for Sustainable Development, we are pleased to announce the Sustainable Development Video Contest. Submit an explainer video on a sustainable development topic of your choice, and you’ll be entered to win a free seat in the UNSSC Foundational Course on the 2030 Agenda! Our first contest honored multiple outstanding volunteer video authors with the Simpleshow Foundation Award. The three categories for videos included Creativity, Social Impact, and a Special prize – all of the winners created fantastic videos! We were inspired by their work, and wanted to create another contest. The idea of this year’s contest and award is to promote the Sustainable Development Goals (SDG), identified and activated through the United Nations Agenda 2030 in order to create a more sustainable world. So, this contest is a fantastic opportunity for individuals and organizations to share their sustainable development message in an engaging video format and help to raise awareness about SDG topics. Any original video, which is made through the Volunteer Initiative, will be considered. Launched in 2017, the UNSSC and simpleshow foundation Volunteer Initiative allows individuals and organisations to create videos to promote action and awareness around the 2030 Agenda for Sustainable Development. The simpleshow foundation provides all participants with free access to a premium version of the video creation tool mysimpleshow. No prior experience in video creation is required. You can script your message on sustainable development, and the tool guides you through a simple process of visualisation and voiceover creation. Your submission will be evaluated on the substantive and stylistic quality of its sustainable development messaging, as well as on the overall audiovisual presentation of the video. The UNSSC will award the winner with free participation in the September 2018 edition of the online Foundational Course on the 2030 Agenda. The simpleshow foundation will award the first and second runner-up with packages of customised simpleshow illustrations. The three awardees will also be recognised at this year’s UN Summer Academy, where their videos will be screened. Moreover, all strong submissions will be featured across a variety of sustainable development communications channels, and among the UNSSC’s and simpleshow foundation’s networks. This contest is thus an excellent opportunity to share your unique message on sustainable development with a wide audience. Sign up for the Volunteer Initiative, if you have not already done so, sign up using this link. You will receive an email confirming your registration, with a link to a webinar explaining how to create your video. We recommend you watch this webinar. In parallel, the simpleshow foundation team will grant you exclusive access to a premium ‘foundation account’. Once your account has been upgraded to a foundation account (usually within one business day), create your video. Encountering any technical or other questions during the video creation process? Not to worry – on Friday, 13 April, the Volunteer Initiative team will host a free webinar to answer any questions you may have. This gives you the opportunity to perfect your video before submitting it. Sign up for the webinar here. Submit your video here , by Sunday, 03 June 2018, 11 PM CEST.